​Multiplexing is a computer network method where multiple signals are transmitted in a single communication channel, such as a cable. For example, in telecommunications, several telephone calls may be carried using one wire. Comparing with music, in our point of view this idea could be compared with the open works/graphic scores where through a single channel, the score, many ideas can be transmitted, depending on the interpretation and input from the performers. 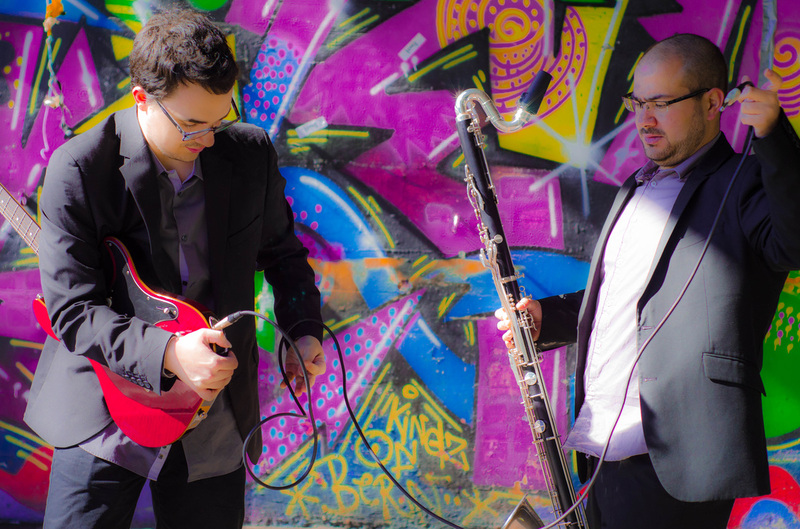 “Multiplexing” is a clarinet and guitar duo created by two young virtuosos from their instruments, Hugo Queirós and Ruben Mattia Santorsa, who wanted to create an innovative project where they have both a performing and creative role. We aim to show, in a single concert, different roles and tasks required in the music of the 2nd half of the 20th century. For that, we took some of the most emblematic composers who were and are true references in the music scene. Primo discorso eretico sulla leggerezza dei chiodi by the Swiss composer Nadir Vassena and HABERGEISS by the Italian Maurizio Pisati, both for bass clarinet and classical guitar, are the only original pieces in this concert, written for this formation; all the other pieces in the concert are developed by the duo, to fit their formation. The lack of repertoire for our formation leads us through a path where we needed to make up our own repertoire; for that we took different pieces with various aesthetics and we worked and adapted them for our formation. Toward the Sea by Toru Takemitsu is a masterpiece for alto flute and guitar, in this occasion presented for clarinet and guitar. For the second half we choose three open composition where, beside the role of performer we had in the first half, we are also arranging, improvising and reacting immediately to the inputs of each other and eventually of the audience, making it an unique and unrepeatable experience. In Tierkreis by Karlheinz Stockhausen, we have 12 small compositions for the 12 zodiac signs, without any fix instrumentation but with a very clear notation; the starting point of our work is all the freedom in chosing the sounds and the structure of our interpretation. In another aesthetic, we present Serenata per un Satellite by Bruno Maderna, where the composer predefines the musical material and the sound events, but it’s up to the performer to choose the succession of the events and the way as they relate with each other. Further in this musical freedom, we present Multiple 5 by Roman Haubenstock-Ramati, where the composer abandoned the conventional notation and opted to use a mix between a graphical notational but keeping the traditional timeline composition. ​After some projects with different formations, Multiplexing it’s our first duo project where we want to show some personal input not only as players, but also as creators with as much as participative action in all the decisions and choices in every piece. 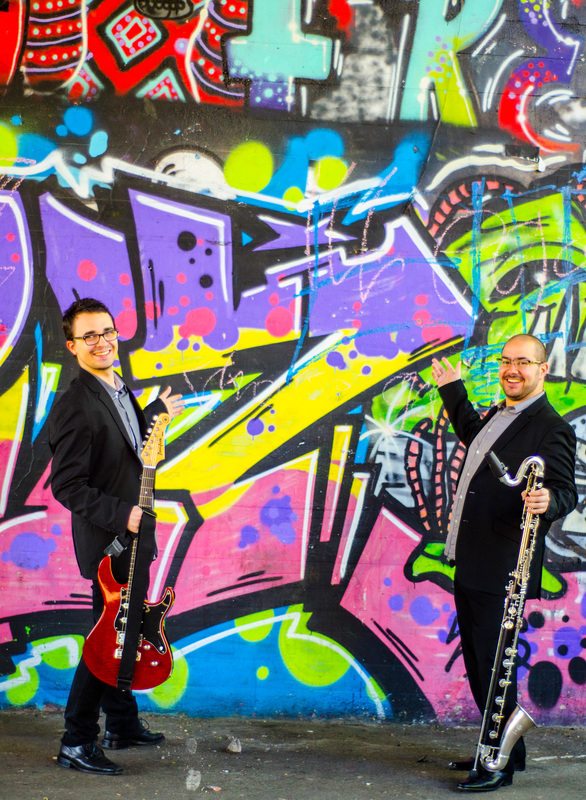 Our aim for a near future is to continue this collaboration to create new repertoire for our formation, also with close contact with young composers.